Bostrom Farms pork is antibiotic and hormone-free, vegan-fed, and ethically raised within 50 miles of our Finger Lakes butcher shop. Get Pork of New York in any cut, as a half or whole hog, plus in a variety of our hand-made traditional and specialty sausages. Don’t forget to take home our ‘out of this world’ bacon! 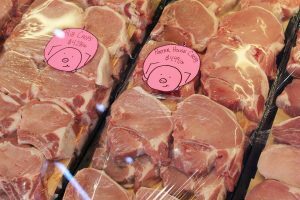 For breakfast, lunch, and dinner, serve pork from Bostrom Farms. Specialty sausage varieties include: bratwurst, beer bratwurst made with local craft beer, pizza supreme, cheddar and ham, apple cider, pineapple/teriyaki brats, bacon ranch brats, Tuscan bratwurst, Buffalo chicken wing, sweet and hot Italian, and breakfast. Availability varies. Promote sustainable and humane farming practices. Fulfill the need for transparent farmer-to-consumer relationships. Teach consumers about the source of their meat products. Establish and market a brand of fresh, premium, and local pork products. Re-establish pork as a healthy, affordable, delicious meat product.